It has been about two weeks since my last update and I'm pretty excited about the changes so far. In this post, I'll update my body measurements, share the latest pictures, and talk about any other observations that I may have since week 4. Let's get started. This week, I am comparing body measurements from November 26 and December 10. In review of the table below, I notice the greatest differences are measured on my waist, hips, and upper stomach. Even before I knew the numbers, my pants told the story. Shoot, my whole wardrobe needs to be replaced. At this point, I can no longer wear any of my suits. They are just too big. Soon, I'm going to need new khaki pants, jeans, and most of my button up shirts. It's a GREAT problem to have. Secondary improvements are found on my neck, upper arm, chest, stomach, and weight. Interestingly, the scale has gone as high as 229 lbs during week 5 back to 224 lbs this week. I blame the dramatic fluctuations on adding salt into my diet while also cutting back on water. I read somewhere that drinking too much water was not good for our kidneys. I'm not sure what was going through my head, but it cost me a few pounds on the scale. Nevertheless, I have removed the sodium and went back to drinking a gallon of water per day. Over the next 7 days, I would like to get my weight under 220 lbs. Hopefully, with the increase in cardio (25 minutes per session), higher intensity workouts, change in supplements, and increased water consumption, I can make this happen. We'll just have to wait and see. Ok, so it's been about 3 weeks since my last photo shoot. For a visual comparison between my earlier progress and today, I'll add pictures from week 6. You may also notice that I've added some pictures where I am not posing. This will give you a greater appreciation for my current status. Needless to say, there is progress, but I still have work to do. In looking at the photos, the word for this week is "slender." I notice that my body appears to have lengthened. No, I'm not getting any taller, but as my stomach slowly shrinks, my abdomen looks longer. I like that. While I am appreciative of the changes, I have to call attention to my stomach area. Unfortunately, it's not going away fast enough. Sure, it is shrinking, as noted in the body measurements, but it's just shrinking at a snail's pace. Understandably, the stomach, for men, is usually the last thing to go. Knowing this, I just have to be patient and consistent. If I keep doing what I'm doing, it will get addressed, eventually. Having discussed my results above, let's talk about some of other changes that I have made since week 3. 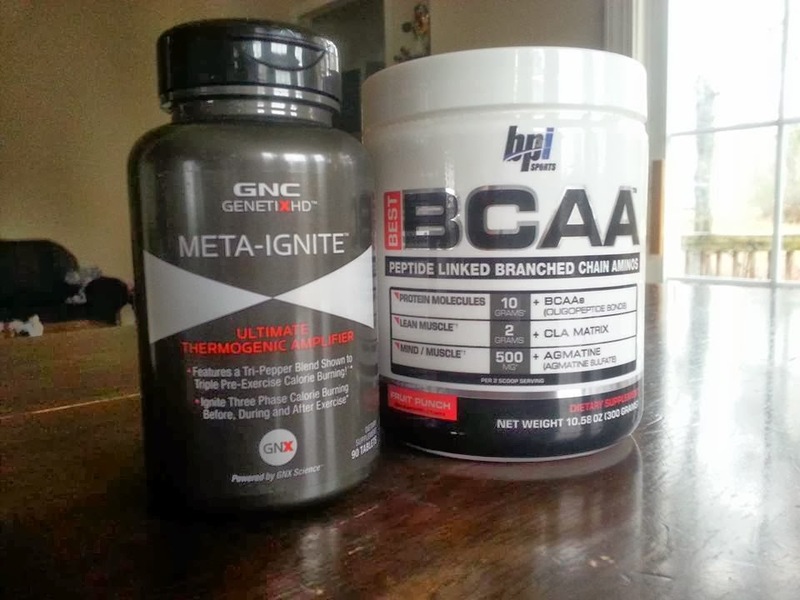 First, Kris added BCAA's (Branched Chain Amino Acids) to the supplementation list. According to the literature, this will help protect our lean muscle mass. As I continue to cut fat, the body is looking for other sources of energy, which includes our muscles. Using BCAA's, we can protect our muscles from being broken down while encouraging the body to continue using our fat storage. That's pretty important if you ask me. Second, I have upgraded my thermogenics to include GNC's Meta-Ignite instead of the triple green tea. While the green tea worked, I wanted to get maximum results and felt this product would do that. I tried it this morning, without any coffee, and I could feel the energy within the hour. Truth be told, I'm still feeling the effects 6 hours later. Wow! As far as following the workout plan, I've stuck to it as outlined. This week, Kris seriously upped the intensity of our weight training and I feel it. From supersets to giant sets, my heart is racing the entire time. Unfortunately, I have still missed a few cardio sessions in the evening. Typically, I'm running behind schedule and I'll need to get out of the gym. To improve, I just need to focus on my schedule and stick to what's written. As week 6 comes to a close, I have two more weight training days ahead. I realize that I have accomplished so much in just 6 weeks, but I also know that I'm only half way through the transformation. This fact leaves me excited and anticipating the continued improvements. It's been way too long since I've seen a flat stomach and I know that it's coming soon. "Thank you!" to all of my friends who are supporting me. It really means a lot. People are noticing the changes and it just feels good. If I can do this for my body, what else can I do? What else can YOU do?